It’s nearly Aussie Millions time! In less than seven weeks, poker’s elite will be packing up ready for their annual pilgrimage “down under” for the Aussie Millions. This is a must-play event for the world’s pros along with hundreds of recreational players relishing the chance to compete in one of the southern hemisphere’s biggest events. The event has grown from a tiny 40-entry field in 2001 to a massive international poker festival. Every year in excess of 6,000 players from all across the world descend on Melbourne for the three week poker festival - all with hopes of taking home part of the estimated AUD$30 million total prize pool that's generated each year. The 2017 Aussie Millions Poker Championship runs from January 11 to 30 with a schedule comprising 26 separate poker events - with buy-ins ranging from AUD$1,150 to AUD$250,000. 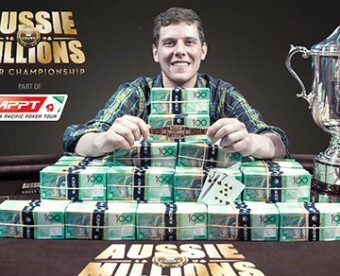 The winner of the Aussie Millions ‘Main Event' will not only walk away with an estimated AUD$1.6 million first prize, but also the coveted ‘Main Event' Champion bracelet valued at over AUD$25,000. In 2016 Canadian Ari Engel took down the Main Event for a whopping AUD$1.6 million. The Aussie Millions has always been known for its prestigious events and huge prize pools. It was the first Championship in the world to introduce a six figure buy-in, and the first again to raise the stakes to AUD$250,000. All High Stakes events return in 2017, with the $25,000, $100,000 & $250,000 Challenges assuring the world's best (and richest) players will make the journey Down Under.